A game-ending triple play is memorable enough, but the way one turned out in a Texas League game Monday won't soon forgotten by any of its participants. 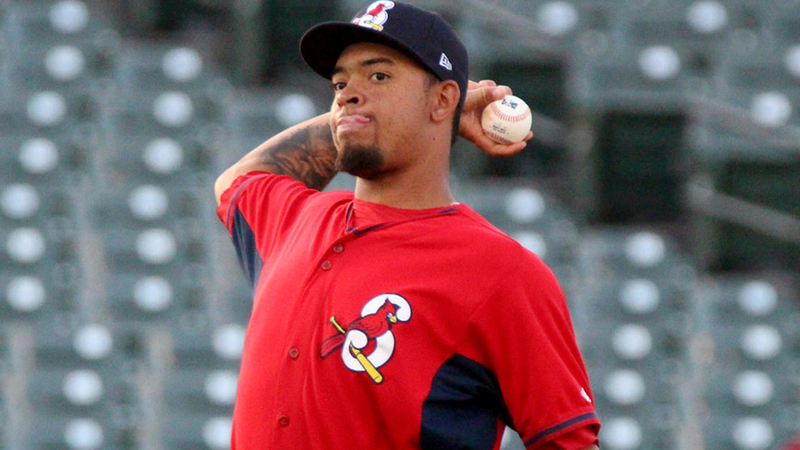 "It's going to take a while," Double-A Springfield manager Johnny Rodriguez said. "Little League, high school, college, Minors, Majors, I've been at every level of this game, and I can honestly say I'll never forget that play." The Cardinals turned a unique 4-6-3-1-5 feat, which included an appeal after a dead-ball meeting by the umpires, to top Arkansas, 8-4, at Hammons Field. It marked the fourth triple play turned in the Minor Leagues' first month of the season and the first in the Texas League since Northwest Arkansas pulled one off on Aug. 31, 2016. Arkansas was threatening in a big way before the milestone. Braden Bishop walked after singles by Joe DeCarlo and Yonathan Mendoza to load the bases. With No. 2 hitter Chuck Taylor coming up as the potential tying run, Springfield turned to closer Hector Mendoza. Taylor lined the 1-0 pitch from Mendoza to second base, and that's when things got interesting. Cardinals second baseman Luke Dykstra snared the liner, but it wasn't initially clear whether he caught the ball in the air or off a bounce. Third-base umpire Kyle McCrady, however, ruled Dykstra gloved it before it hit the ground to retire Taylor. Dykstra, without seeing that ruling, instinctively flipped the ball to second to attempt the start of a 4-6-3 double play. In light of the catch ruling, though, the toss to shortstop Edmundo Sosa retired Mendoza, who was off the bag toward third, for the second out. Sosa, also unaware Taylor had been called out, tried to eliminate him with a throw to first baseman John Nogowski. In the confusion, Bishop returned to first base before the throw, making him safe. Meanwhile, DeCarlo scampered home without tagging up at third, leading Rodriguez and other members of the Springfield dugout to yell to Nogowski to throw across the diamond. By the time the first baseman began to do so, Arkansas manager Daren Brown had entered the field of play to discuss whether the initial ball touched the ground with the umpires. The crew immediately called the play dead and huddled to discuss what would happen next with Rodriguez waiting for an explanation. "I started going out, and [home plate umpire] Kyle Wallace tells me 'We got it, Johnny. We're going to meet,'" said the Springfield skipper. "When they came back, they said, 'All right, we've got two outs. The runner at first is safe and we're going to put the ball in play. He didn't say anything more than that, but he didn't need to. I knew we just had to appeal to third." That's when the 1-5 came in. When Wallace marked the ball in play, Mendoza tossed it over to Tommy Edman at third, and DeCarlo, who was in the dugout and unable to return to the field of play, made the third out of the play and the last out of the game. The play could have avoided the dramatic minutes of waiting for the Brown interruption and the umpires' meeting had Sosa simply thrown to third instead of first, but Rodriguez wanted to make it clear he didn't blame his shortstop. "Sosa did the right thing, definitely," Rodriguez said. "When he's running to second base to cover, he doesn't know it's been caught. The bases were loaded, no outs in the ninth and the wind was blowing out. He's worried about the double play first, not a triple. Dykstra did the same thing by firing to second. If we get the double play, it's one run in and two outs. They didn't know the umpire already raised his hand. The ump's behind the pitcher too because of the situation. It's tough to see. I don't blame anyone there. It worked out." The Cardinals were in that winning position in large part to due to No. 5 hitter Victor Roache. The right-handed slugger belted two homers and drove in four runs. His second dinger of the day -- a two-run shot in the seventh -- broke a 4-4 tie. It was the 2012 first-rounder's first two-homer game since May 14, 2015 with Class A Advanced Brevard County in the Brewers system, and his six homers in 21 games this season match his total from 2017 in 36 fewer contests. "It's a lot of launch angle," Rodriguez said. "He's putting in a little more lift in his swing plane. He's got the power and the leverage, but some of our hitting coaches have worked with getting more from his angles and he's really caught on to it. ... The wind was going out, but the two Roache hit were no-doubters. One hit the trees, I think. They had some life on them."